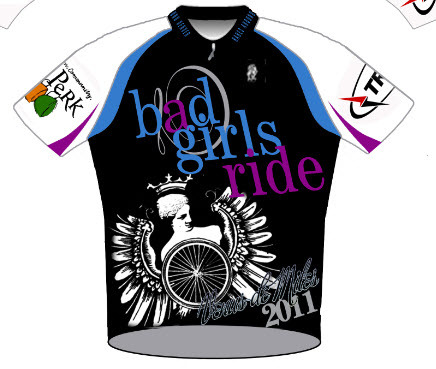 Ride with the BAD Girls Team for the Venus de Miles All Women Bike Ride August 28th. Limited edition jerseys on sale now! Register now for BAD discount! It’s a ride not a race…come play with us! Venus de Miles is a lot of things – a celebration of sisterhood, support for Greenhouse Scholars, and crazy fun – but one thing it’s not is a race. So, don’t be afraid to walk your bike up that hill, stop to listen to a band, and, most importantly, enjoy yourself. Join us August 28, 2011, for the fourth year – it’ll be bigger, better, and more inspiring than ever. Why not ride with a bunch of BAD Girls?. How bout riding and sporting one of our limited edition cycling jerseys? 100% of jersey proceeds will be donated to Greenhouse Scholars and last year we raised $1000 for the cause. Help send some kids to college while you meet, mingle and ride with 1800 women. Babes Around Denver is a proud media sponsor of this awesome event and 60 women signed up with us in 2010. Register now and select Babes Around Denver for the team name from the drop down menu and use VDMPARTNER05 to get the BAD discount. Registration fee goes up August 21st!!! You can ride any distance and still be BAD!! !